As part of our range of wire rope for dockside cranes, this 8×19 construction option is strong, reliable and safe. It is offered in a number of diameters, and we can also supply this type of rope in whatever length you require. 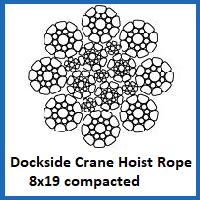 Read on for more information on the dockside crane hoist rope 8×19 compacted construction wire rope. This wire rope promises impeccable performance, with its 8×19 construction allowing it to offer greater load-bearing abilities than many alternatives of equivalent thickness. The configuration of the wires ensures a higher fill factor than would usually be seen, with minimum breaking loads ranging from 43kN to 238kN on this range. Breaking load goes hand in hand with diameter, and there are lots of variables on offer in this respect. The narrowest of the bunch measures 6.4mm, while subsequent options step up at increments until the final 15mm option is encountered. This is compacted wire rope for hoisting in a dockside context, hence its additional ability to remain intact even if it is subjected to crushing forces. The only point to note is that its design does not give it any non-rotating properties, so our 24×7 non rotating construction rope or alternative products in this category will be a better choice for certain crane-lifting scenarios. The Rope Services Direct team can help with your crane rope questions, give you a quote for compacted rope for hoisting and provide comprehensive specifications for any product on our site. Call us today on 01384 78004 or email us if you would prefer a written response. 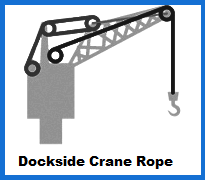 Dockside Crane Hoist Rope 8x19 Compacted Construction Overall rating: 5 out of 5 based on 6 reviews.